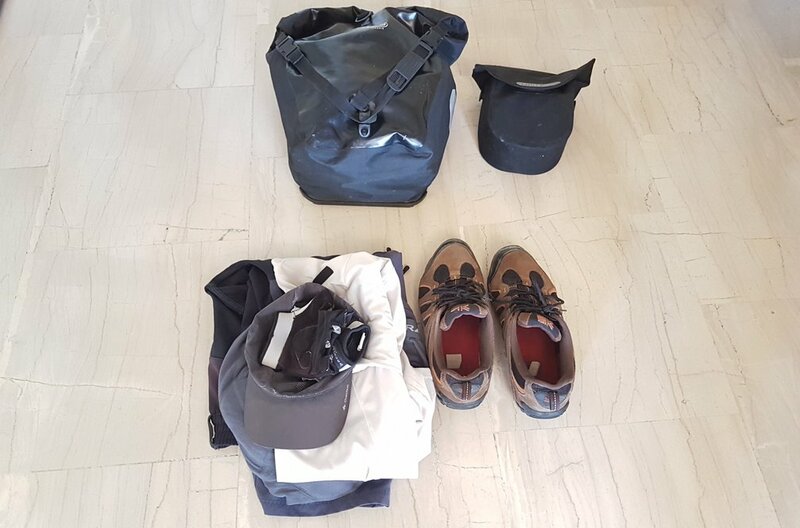 This is my bike touring gear list for a one week bicycle tour. As I am basically credit card touring, I've managed to fit everything into one pannier! Check out the gear list here. It's August, and I've got a free week here where I live in Greece. So, I've decided to put a short, week long bicycle tour together. I've also decided to approach this bicycle tour differently. As I have limited time, I'm going to forget about camping and cooking for myself. Instead, I'm going to travel light, and use small guesthouses and hotels along the way. Welcome to the world of credit-card bike touring! 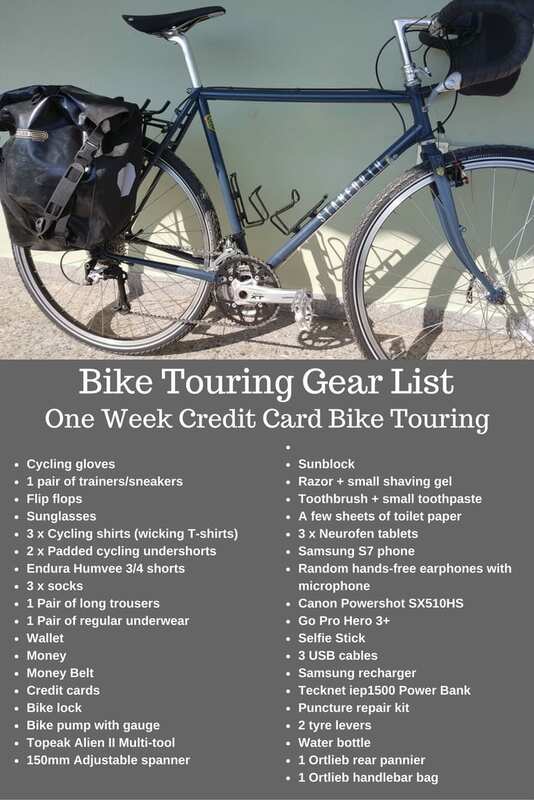 What do I need to take for credit card bicycle touring? I'm not going to need much. In addition to my bike touring essentials, I need a few clothes, some basic tools, and my cameras to take video on the road. In fact, it turns out to be so little that it all fits in one pannier! I considered spreading it out over 2 panniers to balance the weight on the bike, but as it only comes in at 5kgs, it's really not worth it! The weight of an additional pannier is probably near 1 kg empty, so why bother? Here's what I am taking, including a few notes as to why. This is going to be only my second bike tour ever where I do not take my laptop! Even when I cycled from England to South Africa I had a laptop stashed away to update the blog on! Instead, I'm going to rely on my phone to make any notes I need. As the tour is only a week in length, I will create all the videos and blog posts about it afterwards. 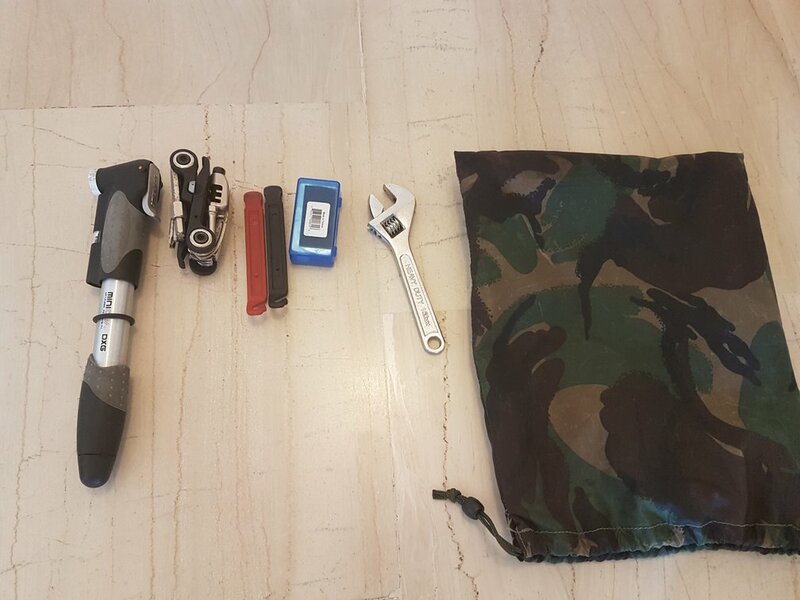 As this is just a short 1 week bike tour, there's no need to go crazy with the amount of tools and spare parts I take with me. In fact, I'm not even going to take a spare inner-tube. (We'll see how that works out for me later!). In addition to the single rear pannier, I am also taking a handlebar bag. This is not for the space, as there is still plenty of room in the pannier, but for the convenience. I will most likely keep my phone, camera, and other items I want easy access to in there. I'm taking what amounts to 3 sets of clothes with me, as I plan to wash my cycling shirts and other items each night at the hotel I am staying at. The temperatures in Greece during August range between 30 and 40 degrees. I don't think getting them dry is going to be a problem! This clothes list includes the clothes I will also be wearing, so not everything will be packed into my panniers. I've never need much in the way of toiletries (See why being bald when you travel is awesome). This is probably my most minimal kit ever though, with everything being small and lightweight. 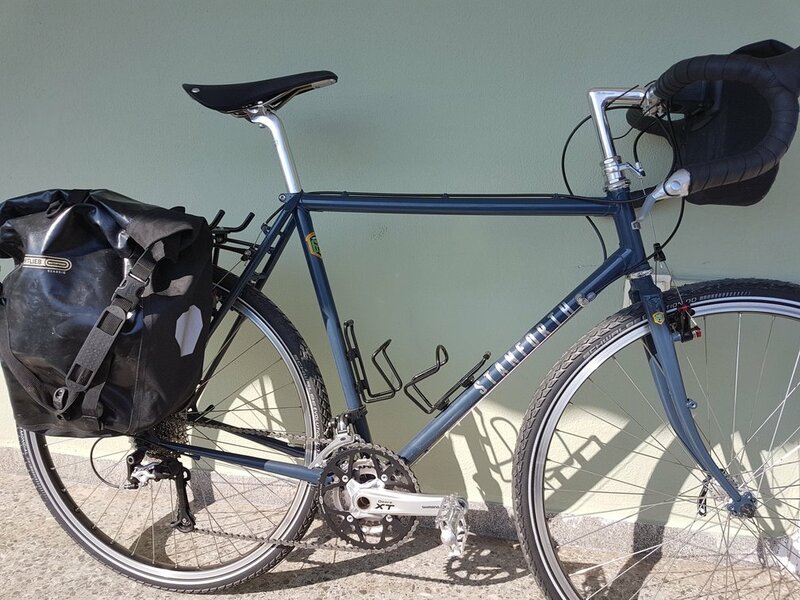 For this tour, I will be riding a Stanforth Skyelander 700c touring bike. Whilst the bicycle touring gear list for this one week tour may look quite big, as I said, it packs down into one single pannier. At less than 5 kgs, the bike is going to feel almost empty, especially when compared to my other trips! If you are interested in seeing where I am cycling, you can take a look at this article here – one week bike tour in Greece.